Samsung officially unveiled its new thinner and lighter Galaxy Tab 4 series earlier this month. 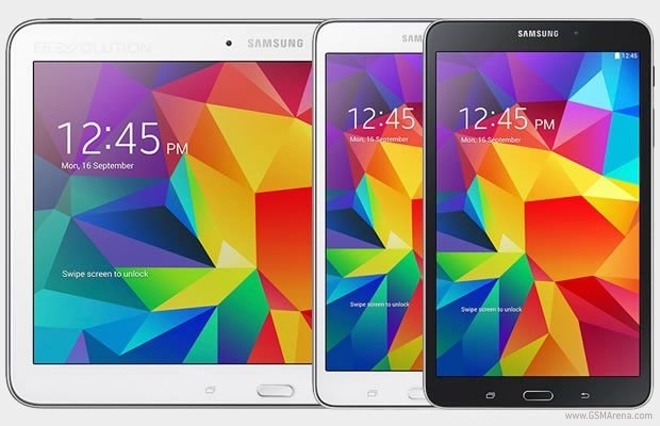 The lineup consists of three devices – Galaxy Tab 4 7.0, Galaxy Tab 4 8.0 and Galaxy Tab 4 10.1 and now the company has confirmed that they all will be available in the US on May 1, with the pre-orders starting tomorrow. The Samsung Galaxy Tab 4 series will be up for grabs in black or white versions. The slates will be available for purchase from quite a few major retailers across the United States – the pre-orders are accepted at Samsung’s online store, Amazon, Best Buy, Fry’s, Office Depot, OfficeMax, PC Richard and Son, Sears and Tiger Direct. AT&T will have the 4G LTE versions of all the three Galaxy Tab 4 slates on sale this summer, while Sprint will offer only the 4G LTE variant of the Galaxy Tab 4 7.0. T-Mobile will have the 4G LTE Galaxy Tab 4 8.0 on sale and Verizon will get the 4G LTE Galaxy Tab 8.0 and 10.1. The Wi-Fi enabled Galaxy Tab 4 7.0, 8.0 and 10.1 will cost $200, $270 and $350 respectively. However, there is now word on the carrier subsidies at the moment. Meanwhile, you can check our specifications pages of Galaxy Tab 4 7.0, Galaxy Tab 4 8.0 and Galaxy Tab 10.1 to know more about the hardware details of the slates.